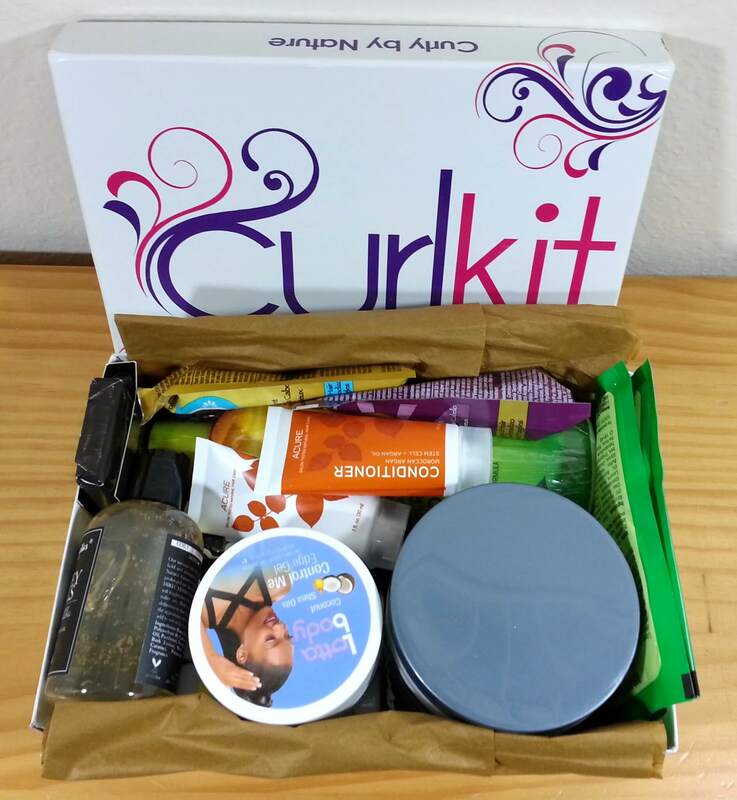 CurlKit is a monthly subscription box for women with naturally curly hair of all types (there is a focus on the needs of women of color). 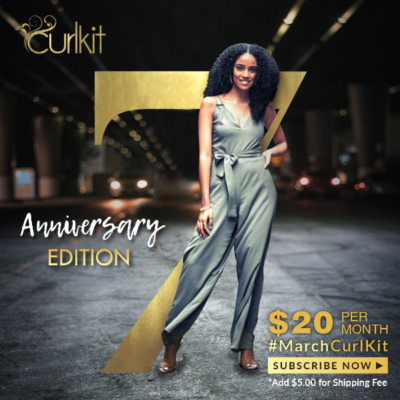 Each month you’ll receive 6-9 samples selected by CurlKit‘s team of natural hair and online experts. 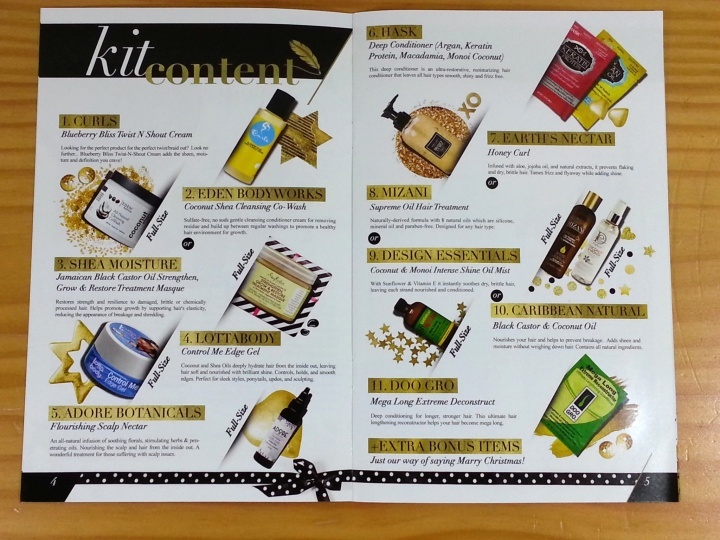 Full-sized products of most samples can be purchased in the online shop. Subscriptions are $20/month + $5 shipping. Curl Life is a mini magazine that comes with your CurlKit and features information on each of the products in the box, styling tips, and a highlight on a featured brand. This month’s theme was Haute Holidays. This month’s box was so full, it was literally bursting at the seams! Everything in the box. There were four full sized samples! So just a little info to get us started. 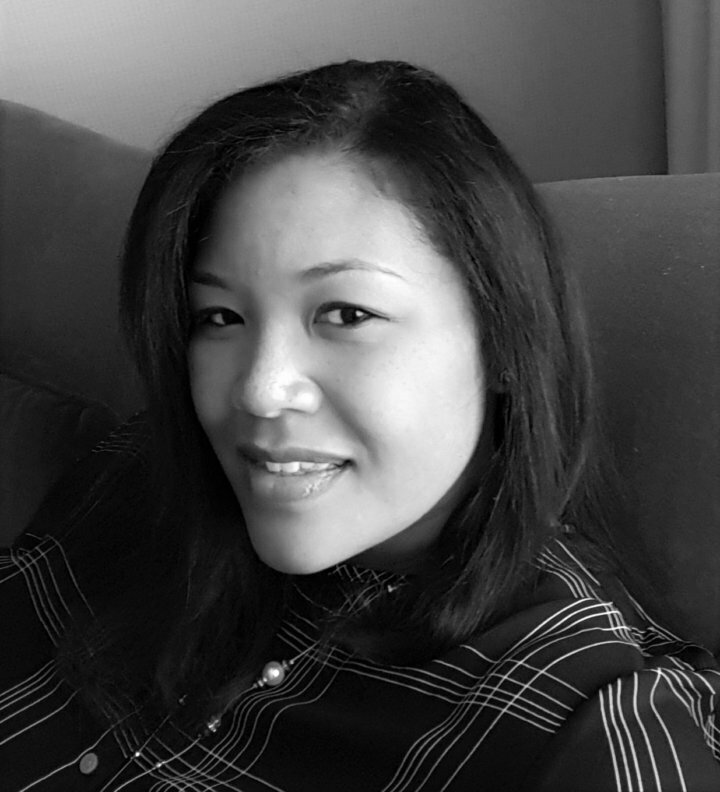 Being bi-racial (Black & Korean), my hair is a mash up of both my ethnicities. I have a lot of hair, but it is very fine and prone to frizz. My curls are a mix of 3A and 3B depending where you look on my head. Please keep this in mind as you go through the review below. Adore Botanicals Flourishing Scalp Nectar ($7.95) This product was developed to combat the creator’s recurring problem with dandruff and recent issue of scalp psoriasis. It contains a blend of oils including argan, jojoba, and avocado (just to name a few) which help to restore scalp moisture and relieve itching. Unfortunately, I tend to have an oily scalp, so this went into my gifting pile. 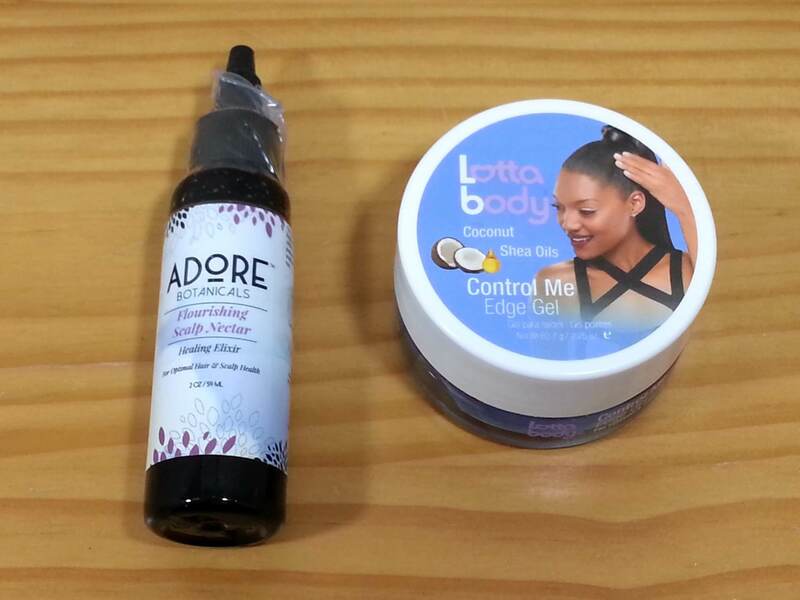 Lotta Body Control Me Edge Gel ($6.00) For those not in the know, the directions for use are in the name of the product – apply at hairline or part to tame frizz and flyaways. The product had a nice fruity scent and was not sticky. Again, another gift item. Acure Moroccan Argan Stem Cell + Argan Oil Shampoo & Conditioner ($2 each) Based on reviews I had read, I was really excited about this set. They are sulfate, paraben, and phthalate free. Definitely noticed a difference in my hair. My only regret is that these were bonus items and not the full-sized box items. Eden Bodyworks Coconut Shea All Natural Cleansing CoWash ($8.99) This is a sulfate-free cream cleanser that should be used between regular washings; similar to WEN. I started cowashing about two years ago and have tried several brands. My regular cowash is also a coconut/shea blend. This one left my hair feeling squeaky clean, almost stripped. I felt that I needed to follow up with a conditioner. Curls Blueberry Bliss Twist N Shout Cream ($2.99 each) This had such a yummy blueberry smell! It is designed to provide moisture and definition while setting twist/braid out styles. Earth’s Nectar Hair Care Honey Curls Curling Agent ($8?) So no actual honey in this. I was a little worried when I saw sodium hydroxide (aka lye) which is usually seen in relaxers. I did a little research, and it is likely in there to control pH. I used this after washing and let my curls air dry. The product was supposed to “sculpt[s] natural curls into soft ringlets”. Like a gel, it left my curls stiff and dry. African Pride Olive Miracle Moisturizer Lotion ($3.39) Another bonus item. This lotion should “stop breakage, split ends, and dryness”. I figured this would be good to use when air drying my curls and to condition my very split ends. It felt heavy on my hair, and I had a hard time with the scent – just not pleasing to me. This did make it easier for me to do a blow out the next day. However, my hair looked a little on the greasy side. This was also in the April box. Doo Gro Mega Long Extreme Reconstructor ($1.50 each) The waxes and parabens make me leery of this product. This one will be passed to someone else. 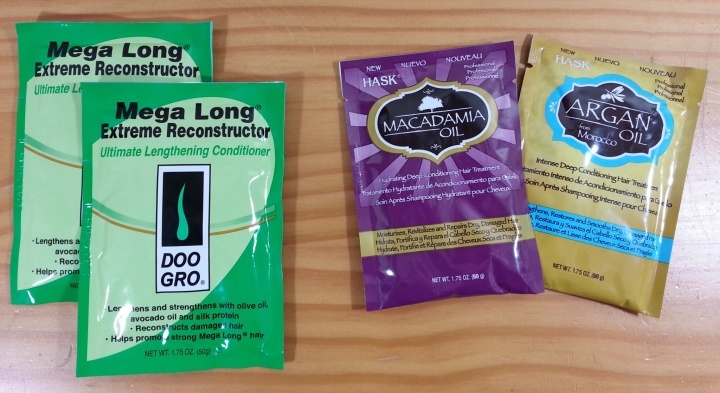 Hask Macadamia Oil and Argan Oil Deep Conditioning Hair Treatments ($2.99 each) Hask products are free of sulfates, parabens, drying alcohols, phthalates, and artificial colors. I’ve used products in the Argan Oil line before and was happy to see both these sachets in my box so I could compare oils. I loved the Macadamia Oil conditioner. My hair felt soft and well conditioned. 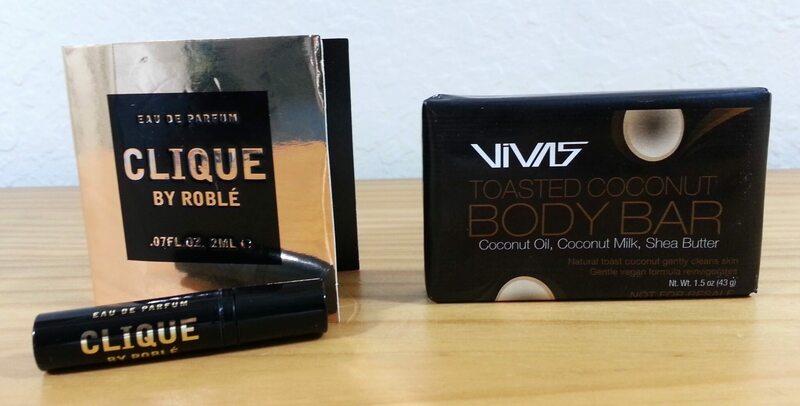 VIVAS Toasted Coconut Body Bar The bar contains coconut oil, coconut milk, and shea butter to moisturize skin. Surprisingly, the coconut scent was not overpowering. Clique by Roble This is the first scent created by Chef Roble Ali. It was designed to contain top notes of a citrus cocktail and base notes of the chef’s signature dessert, French Toast Crunch. I’ll be the first to admit that I am not a great nose. This reminded me of one of my favorite Bath & Body Works scents, only stronger. This box was valued just over $50 and jam packed with goodies! There was a nice variety of products/brands. While I don’t feel that this box is a fit for me, I would definitely recommend it to the women of color I know! 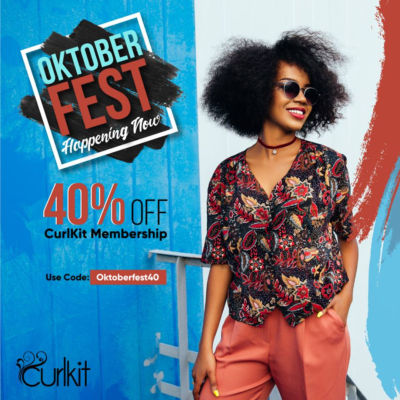 Visit CurlKit to subscribe or find out more! Get 15% off your subscription with coupon code SIZZLE. (SANTA25 is still active for 25% off but it may expire at the end of the day or earlier). 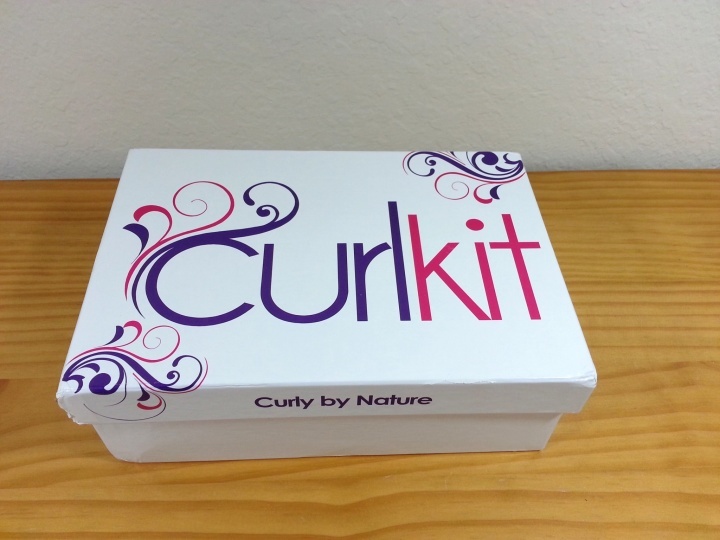 The Description: Each month, CurlKit sends out a selection of 6-9 samples that their team of online experts, researches and even tries themselves. 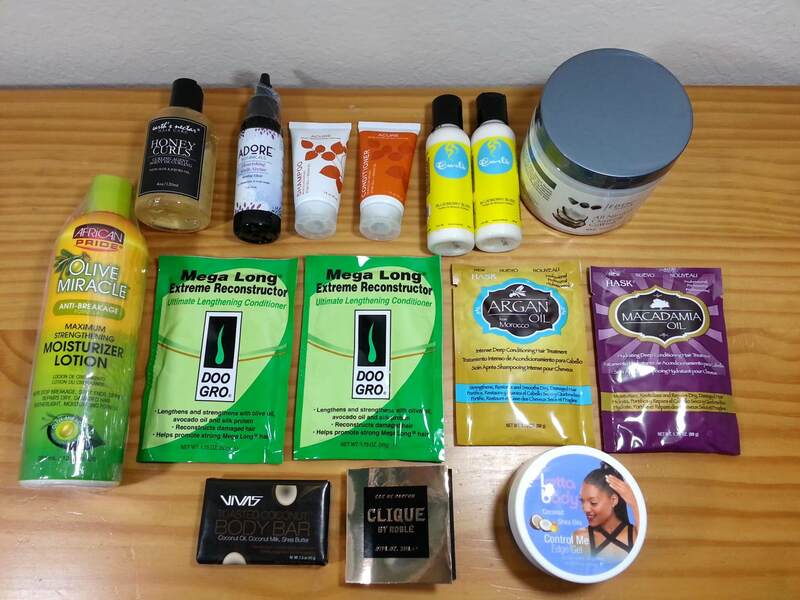 In each CurlKit you’ll receive everything from pomades and conditioners to natural hair tools, from well-known brands as well as emerging gems. 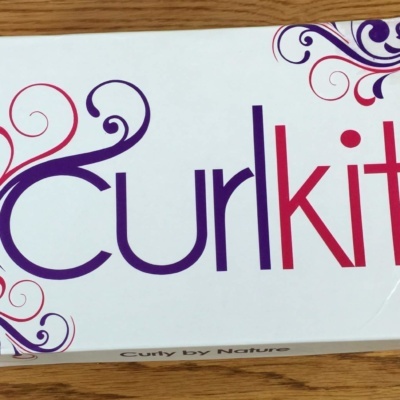 See CurlKit in the Hello Subscription Box Directory! The Categories: Subscription Boxes for Women of Color and Curly Hair.Subscription Boxes for Curly Hair. 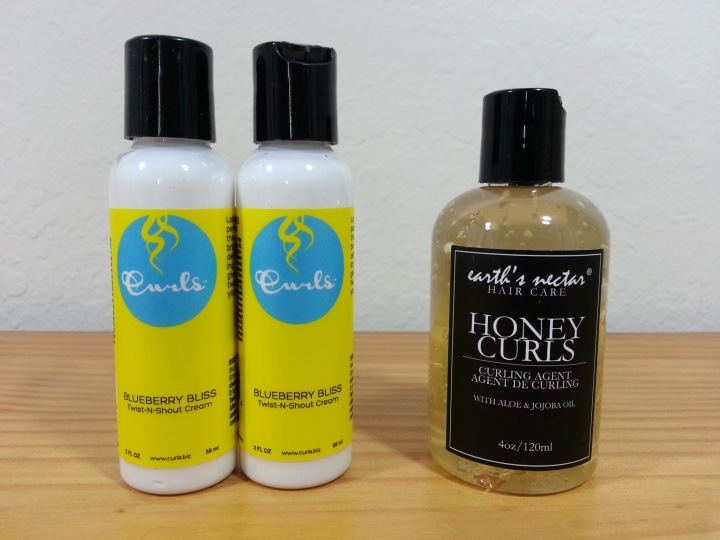 The Reviews: See all our CurlKit Reviews. Each month, CurlKit sends out a selection of 6-9 samples that their team of online experts, researches and even tries themselves. In each CurlKit you’ll receive everything from pomades and conditioners to natural hair tools, from well-known brands as well as emerging gems. Get 20% off your first subscription. Use coupon code groove. Find longer length subscriptions under the membership tab. I didn’t purchase this month. 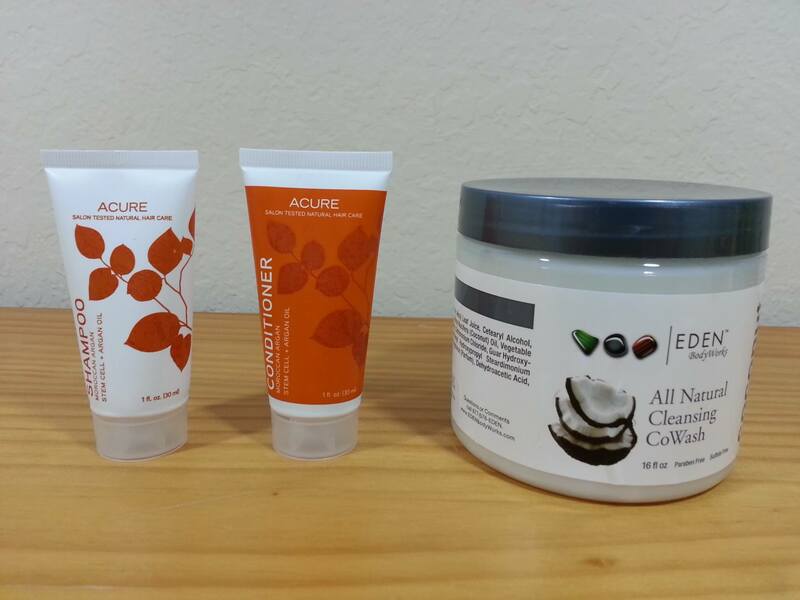 I received the Acure shampoo and conditioner in other sub boxes in the past. I liked it enough to buy the full sizes. They work great with my hair.